Harvest Moon was born October 2006 and officially launched in June of 2007 By Rodney Harper, he pioneered the natural beard dye industry and re-invented the natural hair dye industry, with both investigative intuition and perseverance. We never copied anyone and only learned by our own experiences and research. We had never heard of henna hair dye or chemical-free hair dye and came up with the idea while at a festival doing henna tattoos, when a lady walked up and said she did her hair with it. At that very moment a light bulb went off. Doing research, he found no one was mixing any henna or indigo and basically sold it in a zip lock baggy and people had to mix it themselves – That was about to change forever. It was when we started doing research that we found thousands of people with “secret” or “summer” recipes. This intrigued our curiosity and started the forward motion of what made Harvest Moon® what it is today. We also soon learned that henna is a perishable commodity and that a whopping 95% in stores was bad and even worse 90% on the internet was also in perish. This sent us on a quest to India that would never be the same. After going through several hundred henna fields and growers, we learned many things that made great henna and horrible henna. The land needed nourishment and the powder simply could not set out over time. It took two years of testing crops around the globe to find the best on the planet. 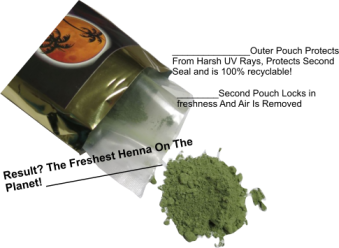 To this date, founder Rodney Harper, has mixed henna over 2,000 different ways with other natural ingredients. His biggest goal is to help the people who have gotten sick from chemical hair dye and those that chemical hair dye is bad for them from the start. Another major impact is our planet! Millions of gallons and packets of chemical hair dye go down the drain each and every year. Our goal is planet and people awareness and the health of our customers. Harvest Moon is double sealed to lock in freshness, it is packaged and sealed immediately giving it a shelf-life of 4-plus years. This eliminates any guessing and guarantees it is fresh when it arrives. To this day Harvest Moon henna has the highest level lawsone content and is the fastest working henna hair dye on the market. So many have tried to duplicate our quality and failed. We have many trade secrets and continue to thrive. We strive to the highest standards of customer service, fast service, and quality product. We answer all calls and with professional staff at the other end. We have lived in Texas for over 35 years and inventory over 1 million in products. We use limited environmental packaging, no boxes, for the simple reason we are tree huggers and animal lovers. Rod is the pioneer in packaging. Many companies have copied his example.